Makeup HQ is a new & beautiful boutique makeup studio specialising in all things makeup, especially training. Sara has been a hair and makeup artist coming on to 20 years, working in bridal to commercial work. 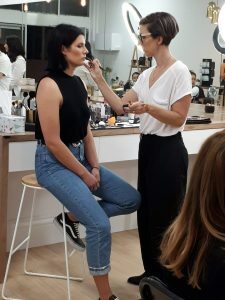 Sara is a fully qualified trainer of 15 years where she has taught at various leading makeup schools in Melbourne & now runs her own makeup workshops from Makeup HQ. Courses range from beginner self-application workshops to your more advanced makeup courses. Her dedicated team of artists also assist in that special occasion hair and makeup, from formals to bridal and event hair & makeup.